This is an attempt at satire. Any resemblance to a person living, dead or somewhere in between; competent or wholly incompetent; greedy or otherwise is purely and yugely coincidental. By Suzanne Kelly. It was a cold November rain that fell on the glistening, gleaming, sparkly, shiny granite stone of the Granite City. The rain even dared to fall on the city council’s Town House and Marischal College. Inside said Town House, a vulnerable Willie Wonky was clearing out his desk. It was late at night and unusually he felt tired and emotional. And indeed angry – too angry even to throw out a few enlightening tweets to his many admirers – though being agitated had never stopped him before. “It was only a fence, a wall, pathways…” Willie thought to himself; he was feeling rather hard done by. He had been forced from his office and his post on the City Council unceremoniously. He felt that the science-based evidence against him was insignificant – after all, there was Pete Leonard, the man responsible for the crematorium scandal, and on a lesser note, he had formally reported that the Tullos Hill deer should be wiped out to create a forest – cost neutral no less – when he already had a letter telling him it wasn’t possible to have a forest on the hill, a former rubbish-tip. The man was soundly hated by 99.9% of his staff – yet got months of gardening leave with full pay and a golden parachute. “If only the public knew how much we gave Leonard.” Wonky muttered to himself. He opened his desk and began taking out the files, deciding which to keep and which to leave behind – or destroy. ‘City Garden Project’ was by far the largest folder in his desk. “What a load of old cobblers. F me that was a stupid idea – ramps going up to a steep height only to descend to the other side. So much for the excuse of ‘accessibility’ being the reason to turn the gardens into a parking lot with astroturf. You’d have to be a mountain goat to get up or down those f-ing arches. So much for anyone in a wheelchair. Willie pulled this thick file out of the drawer and unceremoniously heaved it on his desk. Rifling through the file drawer was considerably easier with the bulk of the Union Terrace Gardens out of the way. “Oh look, the Stewart Milne Stadium plan.” Willie snorted derisively. This huge white elephant was going to be great for everyone, especially one Stewart Milne. File after file Wonky pulled out of his desk, from cabinets; dust was flying. Outside the rain intensified and the wind howled. 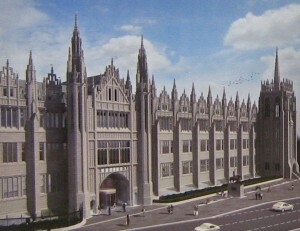 With each passing file he found – ‘Tree for Every Citizen feasibility study’ (by the man who gained £100k if it went ahead), ‘Art Gallery renovation costings’ (a work of sheer fantasy Wonky thought to himself with a sneer), ‘Donald Trump impact study – benefits for Aberdeen City, by VisitScotland’, ‘Invitation to Trump’s doctorate celebration’; ‘Benefits for Torry of having a breaking yard and incinerator’ – dozens of reports, papers, invitations and so on were piling high on Wonky’s desk now. The wind moaned louder and the windows rattled, but Willie ploughed on. ‘Gerry Brough – curriculum vitae and list of academic credentials’; Wonky laughed aloud as he found this file; Brough was the bully who shouted down all opposition to the Garden project and stopped the public having a vote on just fixing the gardens up. “F this wind and rain.” Willie thought as he turned on his computer – well, it was still his for a day or maybe two, as he decided to have some Netflix and chill. He opened an new tab and waited for Amazon videos to load up; he swiped haphazardly at the screen and hit the Christmas movies button. Willie unlatched the window; as rainy and windy as it was, he had unaccountably become clammy, hot and excitable. When he crossed the room to return to his desk, he could see there was a big box still on top of the cabinet, a yuge box. “F that, I’d better see what the F’s in that F-ing thing.” Willie said, his anger growing. A random Christmas movie whirred into life on his laptop; ‘Charlie and the Chocolate Factory’ had started. He could hear it play in the background. Pushing his swivel chair close to the cabinet, Willie stepped onto its seat, reached for the huge cardboard box high on the shelf and started to pull it towards him. At that moment several things happened all at once. The wind suddenly gusted, blowing the windows wide opened. This caused the papers in the room and on his desk to spring to sudden life and swirl through the air. “Waa F!” Willie thought as this sudden commotion caused him to lose his footing and the chair started to wheel away. Alas, he had not lost his grip on the giant box. The box Willie had grabbed slid off the shelf, knocking him straight between the eyes, causing him to wince and howl in pain as he fell backwards. Then to cap things off, a long-forgotten trophy ‘Aberdeen – best employer in Scotland’ made of faux granite and cheap metal clonked Wonky straight on the head. Down and out he went. “What the F?” Willie thought, then he opened his eyes. He was in a vast crowd in front of the Aberdeen Art Gallery. Crowds cheered. There was a podium on which were about 8 of the most ridiculous-looking people Willy had ever seen. The man who congratulated him was a tall, thin man of about 70. The man, dressed in a top hat, tails and with a big bow tie kept speaking. “I better cut down on my order” thought Wonky as he was helped to his feet. The frenzied crowd roared with its approval. The crowd cheered some more. The crowd were delirious with joy. There was more cheering, as you’d expect. Again with the crowds cheering. The crowd was delirious by now with joy. The crowds cheered more furiously than ever, as the lucky winners – Donald Trump, Sarah Malone, Willie Wonky (who was still feeling groggy and confused), Professor Bill Ritchie, Peter Leonard and Stewart Milne all stepped away from the crowds and past the statue of Sir Robert The Bruce towards a revolving door which would lead into the magical Marischal College building, where the magic happens. Willie looked at the statue. For an instant he thought the horse snorted and Sir Robert bowed his head to expose a tear, but the fancy lasted only a moment. Here we are! All pack in now! And Sir Ian stepped into the revolving door. The other guests did their best to cosy up to him. “Easy Stewart, if you get any closer you’ll be behind me.” chuckled Sir Ian. Willie didn’t see why they all had to crowd into the same section of the revolving door, but no one else complained; they just looked adoringly at Sir Ian. “-No need to worry my boy, it’s just one of the Troompa Loompas who run Marischal College.” Smiled Sir Ian Wood. “No, that other hideous thing!” said Wonky, pointing to another orange skinned creature that looked only half human. “Ah, that’s Valerie Watts, the old Chief Executive. She’s been stuck in this revolving door for years now, one executive appointment after another, going around in circles.” Said Sir Ian. 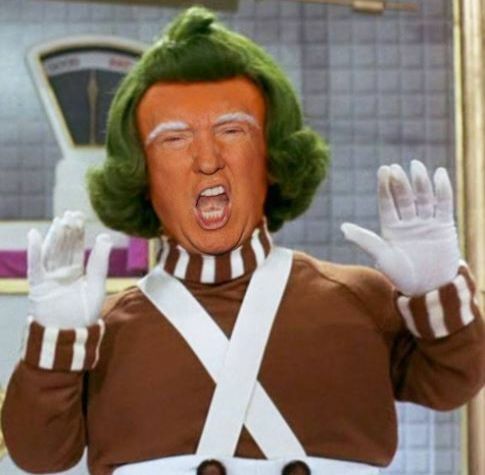 “Stick with me everyone, you’re on the ride of your lives!” Ian said, as the real Troompa Loompas, orange skinned minions with frizzy white hair started to make the revolving door spin faster and faster. The revolving door was jam packed, the Troompa Loompa s made it go faster and faster. Willie Wonky could see shapes as the revolving door spun round – there were flowers, birds, meadows of grass, gorse and birds. The elevator slowed, and out the occupants all spilled onto Tullos Hill. A deer ambled past. A quick gunshot rang out, and the deer fell dead. “Isn’t it beautiful? !” asked Sir Ian. Wonky looked at the dead deer, but noticed Ian was pointing at a parking lot by a new building. “Wood House and its new parking lot!” Sir Ian sighed. Everyone laughed and clapped. The deer made a further spasm. Gunshots echoed all around. “Pete, I like your spirit. You not only got rid of these deer, the migration of which was also a stumbling block for other projects – more of that soon – but you let the land donated to the city fall into such disrepair that the private owners took it back. If there’s now coincidentally a parking lot I need for my beautiful new building, then I thank you. “And all that money paid to the consultants – what was that guy’s name – Chris Piper? Then well done you” Sir Ian said pinching and shaking Peter’s cheek. As the group surveyed the parking lot, the now barren hill save for a few dying saplings in tiny tree guards, a group of the Troompa Loompas marched into the scene. As the Troompa Loompas gathered the group together to go to the next destination, they broke into song. Like Sir Ian and Helen doopity do. As they were getting ready to leave the hill, Willie was sure he saw Sir Ian give Pete a bag marked ‘swag’. The deer’s tiny back leg gave its final twitch. “And now if you’ll all pile onto this magic bus” said Sir Ian as the Troompa Loompas helped the guests get on a Number 3 Stagecoach. All the while Willy Wonky felt something was wonky. The next stop is Loirston Loch! Where I’ve got a surprise for my friend Stewart! “Sir Ian,” asked Sarah Malone-Bates. She pointed to the gridlocked cars on Wellington Road. Willie started to ask whether the new Wood building with its full parking lot was a good idea for this already congested road (which was and still is one of Scotland’s most over-polluted Roads) but a Troompa Loompa shot him a dirty look. “It will take us no time to get to Loirston, isn’t that right Stewart?” said Sir Ian with a wink. “Fifteen minutes? It takes that longer than that to get to Torry as it is.” Willie thought as the last of the entourage climbed on the magic No. 3 bus which sped off and to Willie’s amazement flew through the air over the gridlocked cars. Before the group knew it, the Troompa Loompas were helping them off the bus and out onto a construction site near a lake. Not a bird could be seen or heard amid the rising girders and hum of machinery. “But Sir Ian, er, don’t we already have a glut of office space? asked Willie Wonky, whose head was hurting and spinning now. “My boy, Willie – when I say ‘we’ need office space – I mean WE. The construction industry, Scottish Enterprise – we have to keep building stuff so we have work to do and can brag about new buildings. Everyone laughed and Willie smiled weakly. Stewart Milne toddled forward, and hugged Sir Ian – although this amounted to hugging him by the waist given the height differential. “You mean the next First meeting don’t you, Sir Ian; we changed the name and the logo – remember?” asked Stewart Milne? And the Troompa Loompas again broke out into song, which was beginning to wear thin thought Willie. When there’s money to be made for you-know-who? The group were ushered awa from the lock, and Sarah humpfed as her 6” Jimmy Blahnik dolphin-hide heels sank into the grass. “Who’s the pilot?” asked Sarah, who looked a little green with envy at the tall blond woman. “Everyone, this is Jennifer Claw.” Said Sir Ian with a wink to the pilot. 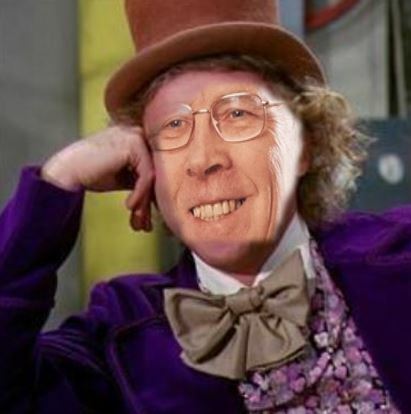 “And that’s the Sir Ian Wood building” he said as all the assembled marvelled and clapped. Except for Willie. Willie was beginning to sense a link to all these Aberdeen City Council projects, and he wasn’t sure he liked it. “So, where’s Lady Helen today Sir Ian?” Willie asked. You could have heard a pin drop. “Ah, she’s off playing tennis; her ball control’s improved, and her strokes are decidedly better.” Sir Ian said as he mopped his brow with a hugely oversized hanky. Sir Ian gesticulated towards the coast south of the city centre which the copter was now flying over. All Willy saw was a plume of smoke, lots of lorries, barbed wire and a huge construction project on the bay of Nigg. Again all those aboard laughed and clapped. “Hey, isn’t this the same helicopter youse guys paid me to fly in to the Menie Estate in when I came over looking for a place for a golf course?” asked Donnie Trump. “The very same.” Sir Ian replied. Professor Bill Ritchie gave his head a jaunty tilt and a little shake of false modesty. “I was once on the board of the East Grampian Coastal partnership. I used to think we needed a public marina, wildlife habitat, and a place to educate young people for maritime careers. But (he said looking at Sir Ian) I changed my way of thinking. Professor Ritchie’s chest puffed out, he was filled with self-satisfied pride and almost everyone on the chopper applauded him. “F me not another F-ing song” thought Willie as those Troompy looking hobbits geared up for another verse. What does an expert get whose opinions for hire? Willie Wonky was starting to get fed up with his golden ticket tour of all the magical things Aberdeen City was making happen. And that bloody singing. He immediately sensed he had overstepped the mark with this question; for a moment a shadow passed Sir Ian’s face and Sarah wrinkled her expensive nose. The professor scurried away and didn’t say a word for the rest of the trip. Donnie was turning blue in the face. At her words Donnie Trump calmed down a bit, his face returning to its orange hue. “She’s smart as a whip. Why everything’s fine and just how we want it. Sarah’s so smart I had one of my little groups invite her to give a talk, isn’t that right honey?” he asked her. Sarah continued to list her accomplishments, how she was whisked out of the Gordon Highlanders Museum to be Trump’s first ever Scottish Executive Vice President, how good she was at moisturising and accessorising, and how much her husband, coincidentally who used to edit the local newspaper, loved her [surely some mistake? 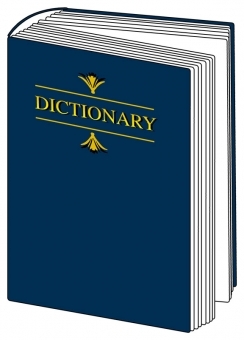 – editor]. Willie audibly groaned as the Troompa Loompas circled Sarah Malone, whose shoulder pads were a marvel to behold, as he knew another song was coming; he felt he was going to be sick. Having the right hair and a beautiful nose? So what if other people think it’s prostitution? Willie Wonky’s brain was putting together all the puzzle pieces from the day, and was starting not to like the picture they were forming. A tumbleweed blew past as the rotor blades slowed, and out the lucky Aberdeen Art Gallery golden ticket winners scrambled into the freezing air. “Anyone for 18 holes?” bellowed Donnie in the freezing winds as the rest of the group ran for the shelter of the clubhouse. Once inside this building on an empty parking lot, Sarah snapped her fingers, and waiters and waitresses appeared with bottles of whisky and glasses. “Trump whisky – £50 a glass or £500 for a bottle. £250 a bottle if signed by Donnie.” She hawked. “Later Sarah Dear” said Sir Ian, adjusting his top hat and billowy bow tie. “No one’s here, aren’t there supposed to be golfers – what’s going on?” asked Willie; everyone smiled at him. The room started to spin as he sipped one of those whiskies. “We don’t want anyone here.” said Sir Ian quietly, the others faces started to look mean and contorted. Willie Wonky stumbled and fell into a chair – a chair with a big Donald Trump crest on it. The other winners, the Troompa Loompas leaned in closer. Willie felt quite ill now, as these ghastly, grotesque faces sneered at him and laughed. Sir Ian spoke. “We don’t want anyone here; never did. Another few years of tax write offs in the USA for Trump – if he doesn’t get impeached or jailed yet – no offence Donnie, but you’re not quite as subtle as you should be sometimes – and then it’ll be sold off. Donnie – we’ll talk about that international charity US tax break later. “It will go to housing – we’ll all see to that. And what housing developer is favoured in this neck of the woods? That would be my good friend Stewart Milne. “And what organisation would get involved with such a huge or if you will ‘yuge’ undertaking? Why Scottish Enterprise of course. I may have retired, but after decades as head of the thing, don’t you think I still have my claws still in it one way or the other? “Think of the construction jobs, the consultancies, the money to be made. And Willie, the granite web is making a comeback; do you think I give up that easily? And when the idea was being promoted so hard, ask yourself two questions – who stood to benefit is one. “Stewart owned the adjacent Triple Kirks, and he needed parking; we could have got that for him, but it’s not all over yet. The other thing to ask yourself – what did the public miss while we were distracting them with a design consultation vote when we already knew what design we wanted – the ludicrous web design. And they fell for it. “We have Donald Trump in charge of the USA; over here he will be allowed to do as he pleases. And while tens – hundreds of millions are moving through Scottish Enterprise, land deals – like when the city sold that land to you Stewart for a peppercorn, and while public land is snapped up – we’ll get people to focus on other things. “Either we’ll threaten to take away what little arts provision they and their children get, or the more mean-spirited ones will be convinced that people from abroad are taking their land, money and jobs – not you Donnie though” Ian winked, any previous trace of gentility gone from his features. “While we’re at it, there’s one more item on the agenda for your tour Willie Wonky – we’re going to look at the City of Culture Bid. “All aboard the helicopter for gigs on oil rigs! How much public money and time did that nonsense soak up? Well, here’s Rita Stephen to tell you all about it! “Remember Willie – whether it’s a football stadium, a parking lot, a breaking yard, Trump’s golf course – and his honorary degree from the University I own that has a building with my name on it – you now know who’s behind everything in this town. Nothing, I mean nothing goes on in this town without my say so. ACSEF, First, RGU and SE. Willie’s eyes had glazed over; the other golden ticket winners’ laughs had turned to a huge roar of noise, and he fluttered his eyes. “Willie, are ye alright mon?” She said. “I was just going to re-write the symphony for orchestra, ship’s horns and horses that was part of me great City of Culture bid tonight, when I saw yer door open. His eyes focused and leaning over him was Rita Stephen, the woman behind among other things the City of Culture bid that made Aberdeen the laughing stock of the western hemisphere – again. “AIEEEEE” Willie screamed, and sprinted out of the office, leaving all of his paperwork behind. He didn’t stop running until he was safely locked in his house and under his covers. The sun was shining. Willie woke up as the phone rang. He remembered with a sudden start his horrible nightmare. He shook his head violently from side to side and answered the phone. Willie thought of all the corruption he knew about; he thought of all the pieces that had fallen so neatly into place in his fevered dream. He took a deep breath. North-east artists have been adding their own splash of colour to Aberdeen city centre as part of an annual project to promote arts and culture. 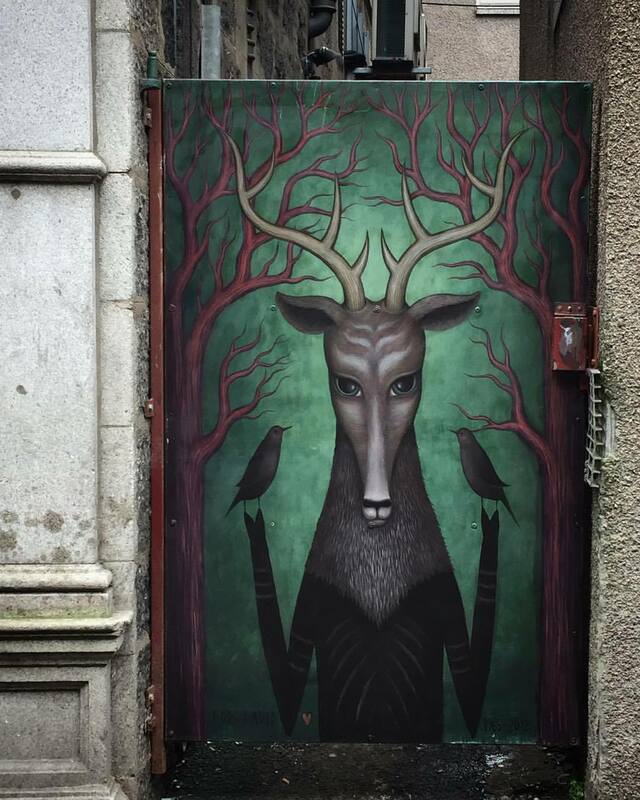 Aberdeen Inspired’s Summer of Art programme is already in full swing this year with a range of creative projects being held across the city centre, including the Painted Doors project. The project will see artists work on decorative paintings on doors of local businesses, shops and other premises on Langstane Place, Windmill Brae and around Aberdeen Market until the end of the month. “The Summer of Art programme is about working in partnership with local artists to make art accessible to all, as well as being a fantastic way to utilise and brighten the city centre. As part of Summer of Art, plans are also being developed for the city centres first outdoor creative space which will allow artists to use a wall in the near Aberdeen Market at the East Green, as a canvass to create their own colourful murals following the successful Nuart Aberdeen Festival earlier this year. “It has been an amazing year for art and culture in Aberdeen, it’s been a joy to see it all so well received by the public and the creative community is buzzing. “Last year’s Summer of Art was a catalyst for change in the city and I was proud to curate the Painted Doors project with Aberdeen Inspired. The project recognised our city’s artists and put stunning artworks on the street for the public to enjoy. Public appetite for street art is overwhelming and this was demonstrated by the success of Nuart Aberdeen. “Aberdeen’s own creativity, sometimes overlooked, has always been here but now we can see it every day, in our doorways and on our streets. “This year we’re adding new doors and artists to the Painted Doors line up, building upon the foundation we laid last year. Seeing art and all forms of creativity and culture on the streets is a vital part of the energy and atmosphere of any city. Aberdeen Inspired is also now reviewing applications for its Grass Roots fund which was launched to support the delivery of local and independent creative arts projects and interventions in the city centre over the summer. The programme aims to cultivate and support ideas and talent in Aberdeen whilst enriching the heart of the city with street and visual arts as well as music and drama this summer. Applications were sought from individuals and groups for grants in three categories: up to £500; up to £2,000; and more than £2,000. Aberdeen Cremation Report: Time Up For Peter Leonard? Suzanne Kelly looks back at a variety of City issues involving Peter Leonard, Director of Housing Environment and Infrastruccture. She concludes, while he is on sick leave following vacation, that in her opinion, it’s time for him to go. Many people in Aberdeen tend to think the councillors are to blame for all the many, many mistakes, flawed plans, waste of money, and bad decisions that take place. The truth is that they only get to vote on reports put before them by officers, and officers can and do drive agenda and stop plans they don’t like. Staff too are controlled by the officers. They are vilified for complaining or resorting to whistle-blowing when complaints to managers fail. Aberdeen Voice is aware of more than one case of staff being micro-managed and having their work time scrutinized to the last minute. There are many people who, while worried about being discovered, want to talk about negative experiences with officers, and that includes Pete Leonard. Head of Housing & Environment Pete Leonard has been implicated in a catalogue of bad decisions. Having just missed a chance to apologise to the public over the cremation scandal so he could holiday, he is now off sick. Reports suggest he will remain out of the office – until terms of his final severance package can be ironed out. Many find his continuing in his post is now untenable following the cremation report – and the public has not seen the report commissioned by the Chief Executive. My long-running interaction with him over the destruction of the Tullos Hill is no secret. He insisted on deer slaughter: when established consultants offered free help, they were rejected. The slaughter was called ‘abhorrent and absurd’ by the Scottish SPCA in the circumstances. The expensive, unsuccessful attempts to establish trees on the hill are his responsibility – he declared in formal reports the scheme would be cost neutral. (Tullos is a former waste dump with little topsoil; the government’s own departments have written that establishing trees there is unlikely. However, it’s made quite a bit of money for consultants, suppliers, and deer stalkers). Leonard’s insistence to the Housing & Environment Committee that the Tree for Every Citizen Scheme would be ‘cost neutral’ has cost well into a five-figure sum (and caused more than 36 deer to be culled needlessly) and may result in further expense to taxpayers soon. A councillor’s proposal to keep the hill as a meadow with deer was quashed before it could be voted on: by Pete Leonard. One of many ponderous reports flogging the dubious benefits of the Muse development of Marischal Square bears Leonard’s name. On 2 March 2016 this report recommends against asking the public for any further input on Marischal Square because the public might experience ‘consultation fatigue’ and may result in a ‘negative customer experience’. Heaven forbid. Customer experience didn’t attract the council’s attention when, despite 3,000 citizens and 3 community councils demanding the deer be spared were ignored. As to consultation fatigue, I think more people would prefer the chance to have their say and risk ‘fatigue’ than winding up with the monstrous white elephant at Marischal – where the Press & Journal will now call HQ for one year free – courtesy of the taxpayer. Leonard has, in effect, proposed not fatiguing us with consultations while wanting our participation. Sounds like quite a balancing act; no wonder ‘resilience’ is also suggested. There are many Aberdeen Voice readers who have fought to get basic housing repairs, fought to have housing suitable to the needs of the elderly and disabled, or even to have safe, habitable places to live. Some suggest the head of Housing & Environment needed to have a more hands on approach. Who scotched the Cafe 52 plan to have a self-sustaining cafe in Union Terrace Gardens? The idea was to have a temporary place under the arches where people could buy coffee and snacks, the Bothwell family were going to pay all the set-up costs, and volunteers were going to run it, as I recall. I do recall that the profits were all going to be churned back into improving the gardens. The departed Maggie Bochel even recommended this go through, and several councillors as well as many members of the public supported the plan. Is it possible that a city council officer stepped in to stop this simple plan, and if so why? This may be a small side issue, but hopefully by now the point has been made that directors and officers can, and do, guide how and what a councillor gets to vote on. As such, we need directors who are competent, who are capable, who are without bias, and who are accountable. Where does the city most fall down? In its management of communities, housing and (obviously) infrastructure. Who has been the responsible Director for Communities, Housing & Infrastructure for years? Pete Leonard. Leonard is on a salary adjacent to £112k per year, plus a generous pension contribution. If he is allowed to remain in post following the various reports (public facing and secret) into the scandal of Aberdeen’s crematorium operations, something is drastically wrong. Bereaved parents were told for years there would be no ash following cremation of their deceased children. In fact, the crematorium, under Leonard’s remit, was mixing the remains of children with those of unrelated adults, and in effect lying to parents. This went on for years. Pete Leonard chose not to attend the public meeting that took place last week; he was on holiday. It was disappointing to the bereaved that he was not there; his non-attendance sent a strong message. “I guess the crematorium for me was a case of things seem to be going ok so a light touch management was ok and I wasn’t really getting involved. “The Investigation found that despite issues about infant cremation coming to public attention following the media coverage about Mortonhall Crematorium in December 2012, no changes in practice were instigated at Aberdeen until November 2013 and July 2014. “There was no evidence that any effort was made by anyone at Aberdeen City Council to clarify at exactly what age or stage ashes were available. The senior managers did not challenge what they were told despite the information emerging from Mortonhall Crematorium nor did they seek information from Seafield Crematorium, or even closer, Parkgrove Crematorium, to ascertain how these crematoria could have been obtaining ashes despite the Aberdeen position that none existed until the age of eighteen months to two years. “Around about that time we received a letter from Sue Bruce (then Chief Executive of City of Edinburgh Council) with the scope of the inquiry that she had asked Dame Elish to perform and I had a conversation with Valerie Watts then Chief Executive of Aberdeen City Council. I said I’d been to see the crematorium team, they assure me everything is okay but I really think we need to get some objective people in to do an audit and investigation into some of the processes and ask them questions. That led PwC to do an investigation, which was very much process based. At the same time, myself and Mark Reilly went to visit the team, got more behind the scenes. “I think not getting ashes had been for as long as they could remember. Certainly with the new cremators they didn’t. With the older ones I don’t think they did, but I think they said previously they may have done in the dim and distant past, there might have been something. I think they gave some examples there, but I can’t really recall. I think it pretty much reflected what the guys said and looked at the records. On reflection I think we didn’t focus enough on behaviour. When subsequently things changed in terms of what people’s story was, my own reflection on myself was perhaps I could have been a bit more challenging around some behaviours. I drew up the terms of reference for the report and cleared these with the Chief Executive but it was based on what Sue Bruce had sent through, it was very similar terms of reference. I think not getting ashes had been for as long as they could remember. Certainly with the new cremators they didn’t. With the older ones I don’t think they did, but I think they said previously they may have done in the dim and distant past, there might have been something. I think they gave some examples there, but I can’t really recall. “An audit by the company PwC LLP was duly commissioned and terms of reference agreed in March 2013. The auditors reported on 9 July 2013. This audit was limited in scope and did not look at the actual cremation operational processes but rather traced a sample of cremations to the supporting records and administrative process in respect of the cremation of stillborn babies and infants under the age of two. “The audit report describes its work as to ‘undertake a data collection exercise and review the current procedures in operation to better inform the Council Officers’ understanding of arrangements and practices.’ The report was based on the documentation available but there is no indication of the Council seeking audit of the actual cremation working processes by a suitably qualified cremation industry expert or body such as the FBCA. “There was no evidence given to the Investigation that after the production of this audit report the Council challenged Derek Snow’s assertion that there were no ashes to be obtained from babies less than eighteen months old. At the very least the information provided by PwC should have alerted the Council to the inconsistency between their public position and what the audit disclosed from the past. “There is no evidence of the contents of the report being probed or checked to ascertain the reason for the different outcomes in the sampled cases. This information should have been of particular interest given the Council’s public position that ashes did not exist for babies under eighteen months to two years. “Staff also had access to manufacturers’ manuals for the cremators they were using. Aberdeen City Council’s response noted in the 10 July 2013 PwC LLP internal audit report was that they would be formalising their written policy and would consider any findings that came from the Scottish Government’s review. press and extensive media coverage of the issues surrounding the cremation of babies throughout the period 2012-2014. “Neither did the receipt of an anonymous letter result in such action. This letter indicated that the reason baby ashes were not being returned to families at Aberdeen was because babies were being cremated alongside the coffins of unrelated adults. Members of staff were still working on drafting the crematorium’s first Operational Procedures Booklet in early 2015. “I guess I felt really let down and right from the word go, what we’d said to the guys was ‘we’re not going to judge you on what’s happened, when you’re in an industry and you follow historic practices, sometimes you might find yourself doing something that culture accepted before. Something which might look horrific but you’re caught up in the middle of that and you’re just doing what you’ve always been told. “So this is about understanding what’s going on’. We had said, ‘if there’s anything, anything at all, now’s the time to get it out, you’ve got our full support’. We couldn’t have emphasised that more and so to then find out that the guys were lying and they’d been so convincing …I was bloody angry to be honest but really upset. Then I was really upset because of the impact on families. 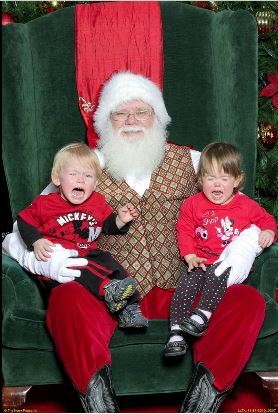 “I’ve got young children myself and you can empathise. So then we had to move into trying to figure what happened and I wasn’t looking at punishing anybody, I just wanted to figure out what had been going on and we don’t really know. I mean, having gone through the experience of believing what they said before, to be honest, anything they said, I took with a pinch of salt. “this was a section of the City Council working in almost complete isolation without any strategic direction, development or quality control of the service, so far as it related to babies, infants and non-viable foetuses. There was little knowledge by Senior Management of the service provided to the families of these babies. “When obliged to consider this issue with the commencement of the Mortonhall Investigation and during the separate opportunity to explain their position to Lord Bonomy and his team the true picture at Aberdeen Crematorium was not disclosed. The Infant Cremation Commission was misled about the practices taking place. “It was clear from the interviews of staff in early 2015 that despite the passage of time since the Mortonhall Report, the report of the Infant Cremation Commission and extensive media coverage of the circumstances at Mortonhall Crematorium that staff had not yet been properly briefed or briefed at all to allow them to have an accurate understanding of the physiology of the bones of foetuses, stillborn babies and infants. 8. The most senior level of management at Aberdeen must provide strong leadership and now take full responsibility for the effective management of the crematorium. It must also ensure that immediate and appropriate training takes place and that effective and ethical practices are maintained. This relates not only to a change of working practices but to an assurance that the culture of the organisation and the knowledge and understanding is such as to prevent any future abuse of the trust of those families who have placed the remains of their loved ones in their care. 10. As with other crematoria there was a total absence of any local written instruction or guidance. This remained the case even in 2015 after an audit report of 2013 which highlighted the lack of written procedure. This meant that the actual practices employed in the crematoria were not documented and available for inspection by normal quality assurance procedures. Had such written guidance been available it may have alerted Cremator Operators to the deviant nature of their practices. There is contradiction about Leonard’s position in the Muse report (do we not consult people so as not to ‘fatigue’ them or do we involve them in the design, etc). Leonard contradicts himself again in his testimony here. At one stage we’re asked to think of him as being a father who’d be concerned about the families; and then we have the inexcusable on the appalling choice of words about ‘slow cooking babies’ and ‘what if the parents found out’. Either you are a caring, empathetic parent – or you use that kind of language and seek to keep your parent peers in the dark. “The Federation of Burial and Cremation Authorities(FBCA) represents all but two of the operational crematoria in Scotland and around 85% of crematoria in the whole of the UK. The FBCA has existed since 1924 and represents the owners and operators of cemeteries and crematoria in the UK. All members of the FBCA have to confirm that they operate in accordance with our Code of Cremation Practice on an annual basis. The process of cremation is regulated by Sepa and there are parameters which have to be maintained throughout each and every cremation, whether adult or infant, however it is important that special measures are taken during the cremation of very young babies to ensure that the conditions within the cremator provide the best possible opportunity for the recovery of ashes at the completion of the process..
For someone with a director’s mandate covering the crematorium, ignorance of this easily-found knowledge is bad enough; it is compounded by the evident lack of interest in pro-actively seeking for it. Changes were to have been made in documentation for procedures; this went un-remedied for years. Should the buck have stopped with Leonard? It should be noted that there is a Customer Services Standards document – but it is being updated, and requests for a copy of the current one have gone unanswered. Aberdeen Voice also made an appointment to view the Officers’ register of interests – and hours before the appointment the city cancelled on the grounds ‘personal data’ would be in the records. The legal team decided that a Freedom of Information request would be needed, and that while councillors’ records are all electronically available, the records for officers and directors were off limits. Let’s hope the wait to see the records won’t take too long (all FOI requests I have made to the city have been just to the deadline or have been late). I watched as the arrogance and assurances from Leonard led to the destruction of a herd of deer that had lived on Tullos for decades without needing any cull. I watched as he stubbornly refused free advice on non-lethal culling, refused to take on board the soil report saying that trees are unlikely to establish while approving hundreds of thousands of pounds on consultants, fencing, trees and deer hunters. I watched as a friend whose stillborn child was told there would be no ashes to scatter after cremation some years ago. I worried as I helped arrange a cremation fairly recently as to what was going on. I watched as the hated Muse project was foist upon a largely unwilling, certainly poorly consulted public – who will now subsidise the Press & Journal with a year’s free rent. I watched as parents were further disrespected by Leonard deciding not to face them at the crematorium public meeting as he chose to vacation instead. I’ve listened to complaints of people with health issues in housing inadequate to their needs. I’ve heard from people who waited months and months for simple housing repairs. I’ve heard from people living in housing where anti social behaviour runs rampant because the city keeps no residential staff to ensure safety. I’ve heard from staff who have felt bullied under his regieme. I now want to watch as Leonard leaves his post with as small a remuneration as legally possible, and leaves quickly. 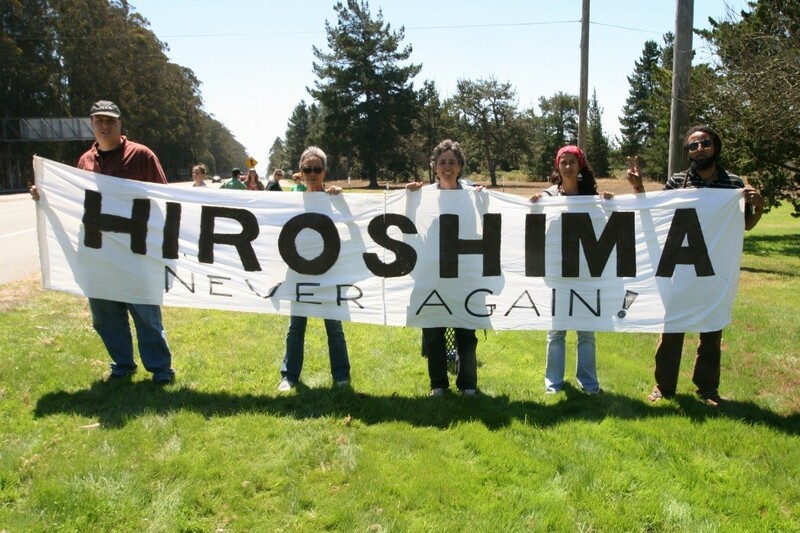 On Saturday August 6th, Aberdeen and District CND are holding a gathering to commemorate Hiroshima Day. It will take place in Union Terrace Gardens in Aberdeen at 2.00pm. The rules of the garden do not allow us to have organised speakers but we shall have two minutes silence at 2.30 pm when, weather permitting we shall lie down. We encourage you to come along with your family and remember the families who died on that day in 1945. Bring flowers and candles so that we can make a peace symbol. Come along with musical instruments to play appropriate music and a picnic so that you can sit awhile afterwards. A leading business organisation is bringing art to life in the Granite City and it could be found in unexpected places. From doors in Aberdeen city centre becoming a canvas for local artists, to decorated pianos and fun Oor Wullie characters, there will be a rich variety of culture on offer under Aberdeen Inspired’s Summer of Art theme. The organisation is hoping to enthuse the north-east public and make art accessible to all with a range of fun projects under the banner. Summer of Art kicked off with the appearance of 10 colourfully decorated Oor Wullie sculptures, which are currently on display at Marischal College until Sunday (July 10). Organised by The Archie Foundation, DC Thompson and Wild In Art, the mini touring version of the Bucket Trail will, like its bigger version in Dundee, raise money for the charity. Soon after the Oor Wullies have travelled on to their next destination local artists will descend upon the city centre to do some decorating with a difference as they transform a number of sites. From mid-July guest artists will work on decorative paintings on doors of local businesses, shops and other premises with the aim of brightening up the city centre and creating living art. Locations for the painted doors will start at Langstane Place and Windmill Brae and progress to The Green and Correction Wynd. The full trail will be announced in due course. This Aberdeen Inspired project will be followed in August by the installation of the Play Me, I’m Yours piano trail, a global sensation which has reached more than 10 million people worldwide. 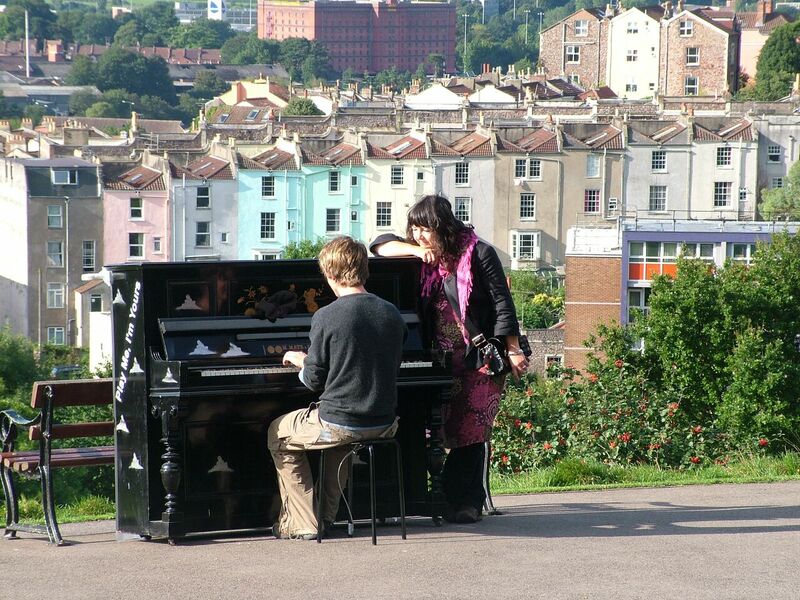 The brainchild of British artist Luke Jerram, it has seen more than 1,500 pianos installed in 50 cities across the globe, all bearing the message “Play Me, I’m Yours”. From August 2 to August 21 imaginatively decorated pianos will be placed in a variety of prominent city centre locations ranging from the Castlegate and Union Plaza to the Courtyard at the Academy, with the aim of encouraging people to interact with each-other and express themselves. The next weekend (Saturday August 27 and Sunday August 28) the arches at Union Terrace Gardens will host a Street Art festival. Led by urban and street art artist Karl Porter and up to ten artists, each participant will be given an arch to canvass their art onto, leaving a vibrant, varied and creative colourful space. “Summer of Art is about community engagement and making art accessible to all, as well as being a fantastic way to utilise and brighten up spaces in the city centre. “It is also a prelude to welcoming Nuart, an international contemporary street and urban art festival made famous in Norway. Everyone at Aberdeen Inspired has been working hard to make these projects a reality and we are looking forward to seeing them come to life in the city centre in coming months. “We have also been delighted to team up with The Archie Foundation to include the Oor Wullie Bucket Trail under this banner and it has been fantastic to see the great reaction from the public to the sculptures already. “Local artists have been planning their artworks for some time now for our painted doors project and are excited to start working on them later this month. This alongside the Play Me, I’m Yours installation and Street Art festival will add vibrant and fun splashes of colour, as well as offering both visitors and locals the chance to try their hand at tickling the ivories. “The level of engagement it has brought amongst people in other cities is amazing and something we hope to recreate here. Aberdeen Inspired is the banner under which the Aberdeen BID (Business Improvement District) operates. It is a business-led initiative within the city centre in which levy payers within the BID zone contribute. Proceeds are used to fund projects designed to improve the business district. Further information on the work of Aberdeen Inspired is available at www.aberdeeninspired.com. With thanks to Paul Smith, Managing Director, Citrus Mix. The arrival of one of the world’s most eye-catching art installations will help underline Aberdeen’s credentials as a cultural hub, according to the organisation which has secured the acclaimed display for the city. Aberdeen Inspired has worked closely with artist Amanda Parer to enable the striking public light installation Intrude to be brought to the north-east. The mesmerising work will be unveiled in December in Union Terrace Gardens as part of this year’s expanded Winter Festival. It will serve as a precursor to SPECTRA, the increasingly popular Aberdeen festival of light. Intrude has been showcased in high profile festivals across the globe – with New York, Paris, London and Sydney all included on an impressive list of host cities. 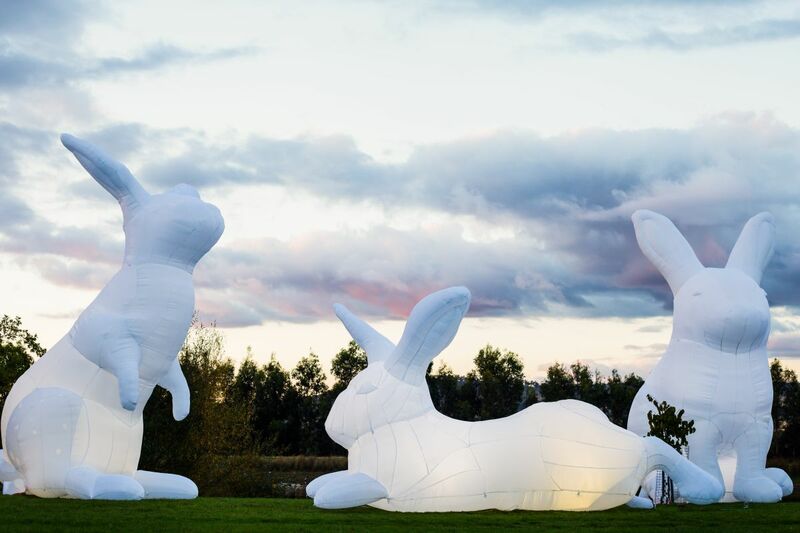 The installation features a collection of giant inflatable illuminated rabbits which stand up to seven-metres tall. “Amanda Parer has earned wonderful reviews for Intrude, which is a truly stunning piece of work and one which has won international acclaim. “The whole idea of having these giant pieces on display is that they don’t fit in. It is a playful art work that evokes fantasy and wonder. It has been designed to give the sense that five giant glowing white rabbits have just hopped in and intruded on a given environment, in this case the Aberdeen’s wonderful Union Terrace Gardens. “With this art work people find a wonder associated with similar childhood events such as Christmas. Yes, there is a dark element to the work, as with many childhood stories. An element of darkness is required to show the light and my rabbits do glow so very brightly. The arrival of Intrude is part of a packed Winter Festival programme, which will also feature the new Aberdeen Christmas Village on Union Terrace. Aberdeen Inspired, Aberdeen City Council and amusement specialists Codona’s are working together to bring the village concept to life from November 25 to January 3. “Aberdeen Inspired is striving to make the city a more vibrant, attractive and appealing place to visit, live and work in. Art is an incredibly powerful way of doing that and particularly when it is an installation as vivid and as high profile as the one Amanda Parer has created. To be able to bring this as a free outdoor exhibition to a north-east audience is tremendous. “Of course art of any type has the power to spark debate and divide opinion, but we have been incredibly encouraged by the excitement which is already building. In recent years SPECTRA has brought a real buzz to the city centre and captured the imagination of thousands of people. We view the arrival of Intrude as the perfect way to set the scene for what I’m sure will be another successful festival of light. With thanks to Jessica Murphy, Citrus Mix. Keen runners are being urged to come forward to take part in a one mile race down Aberdeen’s longest shopping street. As the precursor to the popular Celebrate Aberdeen parade, the fourth Union Street Mile is being held on Saturday August, 22. Sport Aberdeen, which organises the free pre-parade event, has invited pupils from P6 and P7 as well as from S1 to S4 to take part. The youngsters’ endeavours will be followed by the adults in the seniors race. All races will start at the Music Hall, with runners heading towards the Holburn Street Junction, where they will then turn and head down Union Street towards the finish line at the Castlegate. “The Union Street Mile is a lovely way to start the Celebrate Aberdeen weekend and we are delighted that Sport Aberdeen is putting it on again. 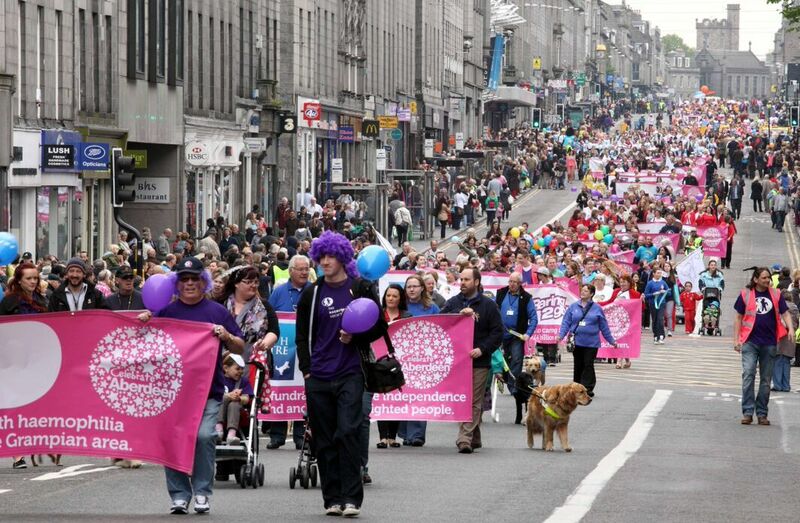 More than 90 charities have now signed up to take part in the celebratory weekend, which includes a parade through the city centre on Saturday, August 22 ,and a host of performances in Union Terrace Gardens on Sunday, August 23. All children taking part must achieve the mile in under 8 minutes. To participate in the seniors’ race, entrants must be 16 years or older on the day of the event. There isn’t a cut-off date for entry but the event is being run on a first come first served basis, with those interested in participating encouraged to get entries in as soon as possible. Runners should also submit their previous best 1500 metres time in order to meet with race requirements. 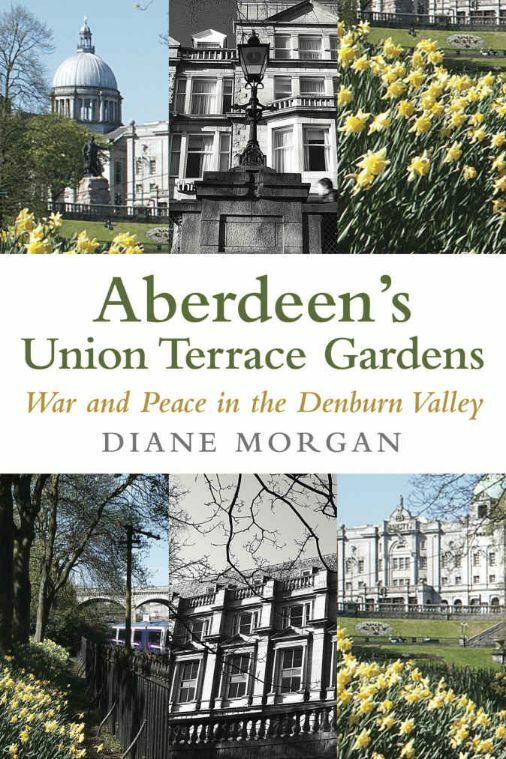 David Innes reviews Diane Morgan’s Aberdeen’s Union Terrace Gardens – War and Peace in the Denburn Valley. One of Aberdeen’s finest vistas is the 270 degree panorama of the northern city centre visible from the comfort of His Majesty’s Theatre’s glass extension, not uncontroversial itself as an architectural development. Robert Gordon’s College, Cowdray Hall and its War Memorial, the Triple Kirks’ sadly-neglected but worthy brick spire, the beautifully-restored Belmont Street buildings, the impressive traffic-swallowing jaws of Union Bridge and Union Terrace’s imposing geometric granite facades can all be taken in with little more than a single swivel of the head. In any weather, the view warms the heart of those with a love of sympathetic, integrated urban development. It defines Aberdeen. At its centre is Union Terrace Gardens, the floor of the Denburn Valley, its greenness contrasting yet complementing the stark beauty of native granite. Who would think that such an unimposing but beauteous defile would have caused controversy for centuries during its development, and very recent real conflict as its future divided opinion and caused lasting damage to political and even personal relationships in Aberdeen? Diane Morgan is meticulous in her narration of the controversies that have surrounded the Valley’s development since its days as a bleaching green on the banks of the burn between Mutton Brae and Corbie Heugh. As in her previous essential heritage volumes, she brings history to life, as if James Matthews and James Forbes, early pioneers of the Gardens’ development, are flitting in and out of the pages along with the original occupants of Union Terrace as that grand avenue’s status grew from tenemented cul de sac to become a highly-desirable residential and commercial location. Conflicts are not new, we discover. Arguments over railway routes, disputed hotel names, kirk developments, bridges, Denburn Viaduct and even the trend for placement of inappropriate city artefacts in the Gardens, has seen the Denburn Valley a continual focus for debate and even rancour in the city. The current Dandara development on the Triple Kirks site means that controversy continues. Of course, it is the recent divisive controversies that most will remember, and the author hands over to Mike Shepherd, the tireless former chairman of the Friends of Union Terrace Gardens, to examine in detail, and subsequently fillet, the business case for the City Square/City Garden Project, all the while displaying the emotional attachment that Aberdonians have for their Trainie Park. Side-swiping at the mania for ‘connectivity’, Ms Morgan points out that Union Bridge and Denburn Viaduct have already solved issues with “the physical barrier of the Denburn Valley” which marks “the place where the new city took over from the medieval town”. This is a superb perspective of the troubled history of Aberdeen’s centre, as impressive as the view from HMT. With thanks to Phil Moar, Citrus Mix. An Aberdeen couple brought extra sparkle to a city ice rink with a unique marriage proposal. 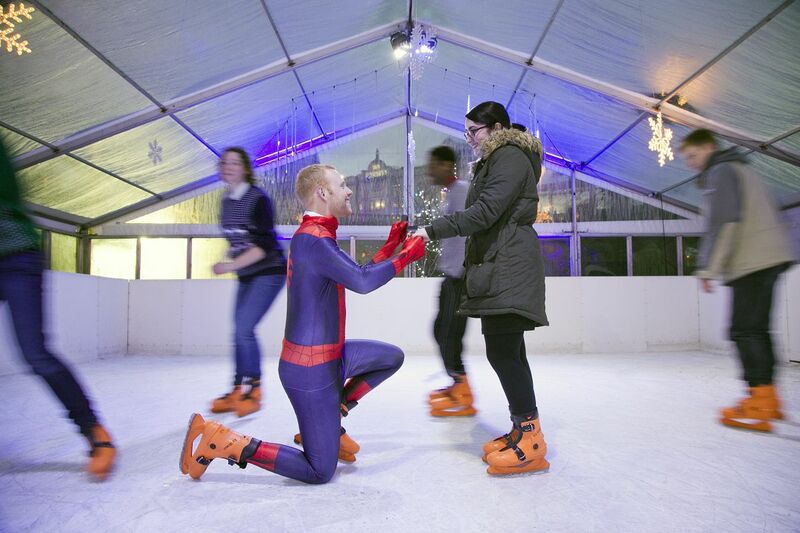 Kyle Wilson produced a dazzling diamond as he popped the question to his surprised girlfriend Grace Brodie at the rink in Union Terrace Gardens. Dressed in disguise as Spiderman, Kyle skated towards his very own Mary Jane, and only revealed his true identity when he went down on one knee. Using cards to share memories of their time together, the proposal marked the culmination of two months of planning after the 23-year-old store manager decided the city centre attraction would be the perfect location. The newly engaged couple met each other on a blind date set up by Grace’s mother, who knew Kyle through a work connection, in August last year. “I knew Grace’s mother through work and we got to know each other quite well. She thought I would be well suited to her daughter so that is how our meeting came about. Everything just went from there, and we went on holiday to Blackpool a few months later, which has great memories for us. We got to know each other quite quickly and it has all been natural. After receiving permission from Grace’s family to propose, Kyle arranged for the couple to take to the ice-rink, which forms part of a programme of Christmas events devised by business organisation Aberdeen Inspired, on Wednesday afternoon. “I planned it all and even borrowed a ring from her jewellery box to make sure I bought the right size for her. I think it will have come as a surprise to her. She knew that she was going to the ice rink, but just thought that it would be a normal day. My knees were trembling when I asked her. I am just so pleased it all went well.” he added. “I was absolutely shocked because I never expected anything like that. I didn’t suspect anything at all. I had seen Spiderman on the ice already skating with people, but I assumed he was there to entertain everyone .I arrived at the rink wondering where Kyle was but the organiser told me he was away to the toilet and told me to go onto the ice. “I went onto the rink and said to the organiser that I had wanted Kyle to hold my hand to help me, and he said that Spiderman would look after me. Even then I didn’t click. I only knew something was going on when he started skating towards me and then I thought it was something Kyle would do. The rink is open from noon to 8pm each day between now and January 4. Admission costs £3 per person, including skate hire, with the entire entry fee being donated by Aberdeen Inspired to The ARCHIE Foundation, the official charity of the Royal Aberdeen Children’s Hospital.